A number of troop companies reported to the fortress commander [at Königsberg] the discovery of several mounds of corpses situated quite close to one another. The commander, General Lasch, ordered a commission to investigate these discoveries. The commission reported that many similar piles of bodies were strewn throughout the area; but in two cases there were virtual mountains of bodies made up of ca. 3,000 women, girls, children and only a few men. Alfred-Maurice de Zayas, A Terrible Revenge: The Ethnic Cleansing of the East European Germans, 1944-1950 (New York: St. Martin's Press, 1994), pp. 40-41. At the edge of town, on the left side of the road, stands the large inn 'Weisser Krug' ... In the farmyard further down the road stood a cart, to which four naked women were nailed through their hands in a cruciform position. Behind the Weisser Krug towards Gumbinnen is a square with a monument to the Unknown Soldier. Beyond is another large inn, 'Roter Krug'. Near it, parallel to the road, stood a barn and to each of its two doors a naked woman was nailed through the hands, in a crucified posture. 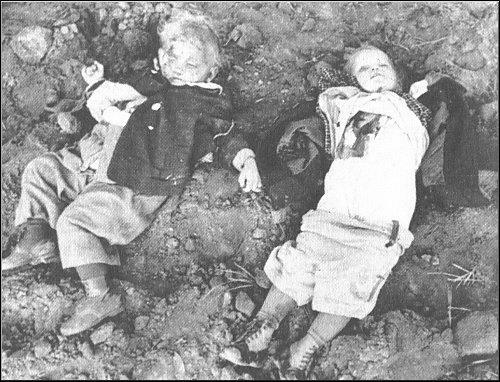 Not a "war crime": German boy and girl, murdered at Nemmersdorf by gallant Soviet liberators. Both the Simon Wiesenthal Center and the Washington Holocaust Memorial Museum, with characteristic Judeocentrism, honor the Red Army in World War II as "heroes" for releasing Jews from their internment in German concentration camps. We carried the corpses to the village cemetary where they lay to await a foreign medical commission ... In the meantime, a nurse from Insterburg came, a native of Nemmersdorf, who looked for her parents. Among the corpses were her mother, 72, and her father, 74, the only man among the dead. She also established that all the dead were Nemmersdorfers. On the fourth day the bodies were buried in two graves. Only on the following day did the medical commission arrive, and the tombs had to be reopened. Barn doors were set on blocks on which to lay the bodies so that the commission could examine them. This foreign commission unanimously established that all the women, as well as the girls from eight to twelve years and even the woman of 84 years had been raped. After the examination by the commission, the bodies were again buried. Alfred-Maurice de Zayas, A Terrible Revenge: The Ethnic Cleansing of the East European Germans, 1944-1950 (New York: St. Martin's Press, 1994), p. 42. Flags will hang in the Holocaust Museum to honor the millions of Soviet soldiers who drove Nazi forces westward and who were the first allied forces to liberate and publicize the existence of the camps ... Much more than simply wartime memorabilia, these military artifacts are a significant contribution to memory, one that will remind future generations of the pivotal role Soviet forces played in defeating Nazism. "Russian Embassy Presents Flags of Liberating Units to Museum," U.S. Holocaust Memorial Museum Newsletter, Fall 1992, p. 6.